I'm going to start building my first flyable FT modified design, and it's going to be a MUTTS. For the same reasons as @Hai-Lee in that the FB I have access to is heavier than the FT stuff. However, I'm going to use the original rudder, and not have the scaloped wings or tail. I plan to build it as a 3ch first, then move up to 4ch. Progress might be slow as time allows. 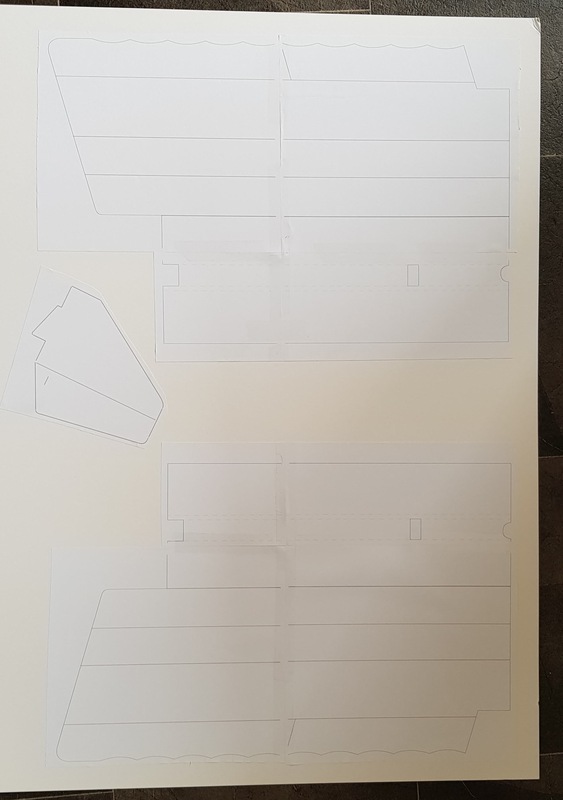 I started to make the templates last night. Ignore the cut outs on the poster board, I had used it previously to make an RR Finch glider. If using the MUTTS wing it can be built with dihedral and so the plane can be flown 3 channel. 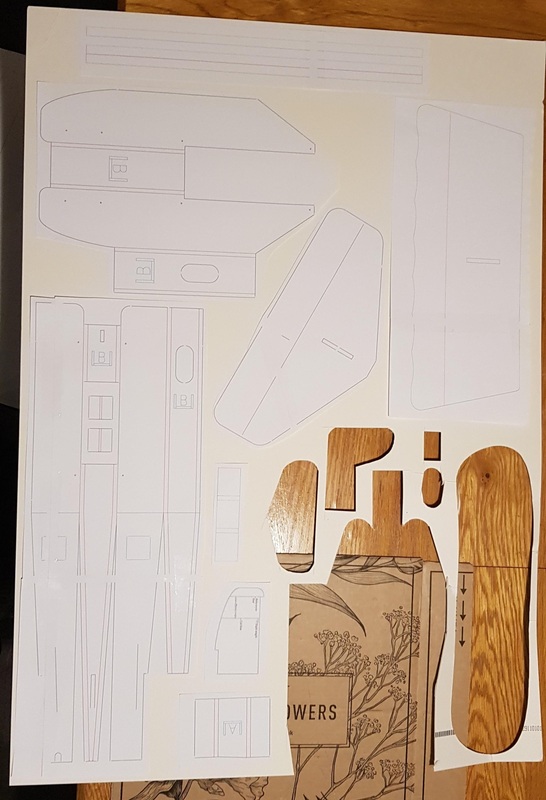 If you are just using the MUTTS powerpod mod on a standard TT fuselage I would ensure that you add the landing gear as sadly large batteries do not fit inside the fuselage . Again if using the original TT wings you could consider the increasing of the wing incidence to compensate for the heavier bird. The MUTTS really loves a SF prop when using the MUTTS style wing and with full flaps, (around 40 degrees) if can crawl around, nose high) just above stall, (practice at height first of course). The original version is still a flying member of my Squadron/hangar. If you have any questions, tips, or issues just let me know! Thanks for the tips. I was wondering how the battery and things fit inside the TT fuselage. It does seem tight. I've still to get servos, esc, and battery, but I've ordered some motors. If the MUTTS flies better as a 4ch, then I might just go with that. My son and I have been using Phoenix a lot with the TT and 3 and 4 channel, so we should hopefully manage to fly a 4ch from the start. I know it's not exactly the same as the real thing, but I imagine there will be a lot of transfer of knowledge from the sim, and the muscle memory will be there. The modified Powerpod allows a 1300 3S battery to be fitted inside the fuselage. As both the motor and battery can now be a lot heavier it is possible to shift the ESC further into the fuselage and the servos further back in the outside of the fuselage to keep the balance where it should be. The landing gear can be either Tricycle or Taildragger which ever suits you better. As you are still lacking a bit of flight experience I would recommend that you fit a few degrees of dihedral as well just to give a little additional stability. If you go with the original flat wing then ensure that you use between 30 and 40 degrees of Expo just to make your control responses, (Especially the Ailerons), just a little subdued and to reduce any tendency to overcontrol initially. If you wish it will fly using the original polyhedral TT wing but with the extra weight you may need to increase the wing incidence to keep the lift up and the required speed down. This cn be simply achieved by fitting a paddle pop stick under the wing Leading Edge. If you have any build questions just ask! So as I'm quite new to this hobby, the electrics side of it still confuses me. Although I've not done a lot of reading up on batteries, esc, motors so far beyond the basics. This is the kit I'm looking at getting for this build. Does it seem ok for this build? Motor - EMAX CF2822 1200kv. I've ordered a pair of these from ebay, as they were new, and only £12 for a pair. It seemed a good deal. Batteries, I'm looking at these 2. Probably go for the 3s as it'll likely be windy where I fly. I've not ordered batteries or ESC yet, and then I need to work out what charger to get. Those items will definitely get it off of the ground for you! You should go for the second series power pod modification for greater battery space and try to get the servos as far back as is possible. you MAY need a little tail weight or a little nose weight depending on how your build goes! You could, after you get it flying and have got some air time on it, go for the fitting of flaps and then look for a similar sized SLOW FLY, (SF), prop! Side note: When I first looked at the pic of the foam board, it looks like you cut the glider pieces out of wood. Then I realized that I was looking at the wood floor through the holes. Thanks. I'll order them next week. The motors arrived today, so I think I'll start building the powerpack. Although there were no mounting screws with them, so I'll need to try and get some.